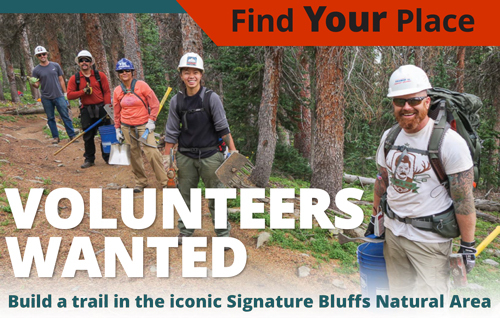 Signature Bluffs Natural Area Trail and River Restoration – Volunteers Needed! Spend a Spring day along the Cache la Poudre River as you work to build a new, natural-surface trail in Greeley’s Signature Bluffs Natural Area. After coffee and a light breakfast provided by our volunteer Crew Chefs, you’ll work along a fairly flat section with dozens of volunteers aged 12+ to clear the trail corridor of shrubs and branches, establish the trail tread itself, install drainage structures to prevent erosion and preserve the long-term integrity of the trail, and possibly reroute some sections of another nearby trail. This project is a great way to get outside with the family and discover a new recreational area along the Front Range; lunch will also be provided. Sign-up to volunteer through Volunteers for Outdoor Colorado.